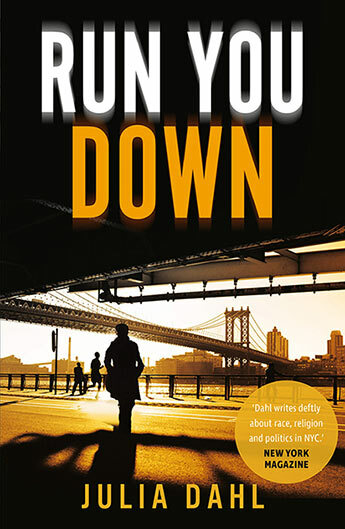 ‘Run You Down’ is the second novel by Julia Dahl featuring feisty young New York journalist Rebekah Roberts. In the first, ‘Invisible City’, which was published in 2014 and won the Macavity, Barry and Shamus Awards, Dahl plunged the reader into the cloistered world of the ultra-orthodox Hasidic community in Brooklyn, and introduced Rebekah, a stringer for the fictional New York Tribune, a young woman with a troubled past not of her own making – her mother ran away from her and her father when Rebekah was an infant, and she grew up motherless – who’s determined to carve out a path for herself despite the heavy psychological baggage she carries. Dahl has a knack for dissecting personal relationships, the stuff of everyday life which she skilfully weaves into her plots, adding a layer of complexity and human interest to her clever, gripping crime stories. 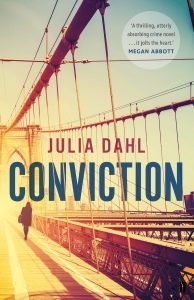 ‘Run You Down’, like ‘Invisible City’ and the third novel in the story, ‘Conviction’, is a brilliant blend of well-timed plotting, sharp character portrayal and spot-on insights into the harsh choices people sometimes need to make in life. Through her characters, Rebekah above all, Dahl deals with these choices unflinchingly, shying away from melodrama, and looking squarely in the eye some extremely troubling issues, anti-Semitism and sexual and gender intolerance above all. Parenthood and daughterhood, family ties, relationships. Wonderful things that can turn into shackles, prisons, nightmares, through poor choices or plain lack of choices, often compounded by ignorance and the fear of speaking out against injustice. ‘Run You Down’ is constructed as a parallel narrative, in which Rebekah’s voice is the counterpoint to that of Aviva, her estranged mother, who reached out for Rebekah at the end of the first novel in the series. Aviva, born in Brooklyn in a family of strictly observant Hasidic Jews and destined for a life of arranged marriage, household chores and child-bearing, is a voice from the past for Rebekah- one she both sought and dreaded – a voice that in this novel tells of Aviva’s own rebellion, after she fell in love with Rebekah’s father and escaped with him to his native Florida. Almost immediately pregnant, Aviva just as immediately recoiled against being a wife and mother. She felt unable to deal with raising a baby daughter in a world that was light years away from the sheltered family life she knew from birth, and to which, almost against her will, she is drawn back to. Not to return to the Jewish fold, but rather living as someone who went off the derech, outside of the Hasidic community, reviled by her own family and earning a modest living as a cleaner. Aviva is a strong presence in the story, as is of course Rebekah. After nearly getting herself killed in the first novel, she is off the beat and working in-house at the New York Tribune when she is asked to investigate the death of a young Hasidic mother, Pessie Rosen. Pessie was found dead at home and her family, as is the Hasidic custom, didn’t want an autopsy, so the cause of death was never ascertained. Besides, the family of independently minded Pessie feared a suicide, a taint on the family’s reputation that would severely hamper their social standing – Pessie lived in Roseville, a small town in upstate New York with a burgeoning Jewish community. Pessie’s husband Levi does however eventually reach out to Rebekah, whose work had come to the community’s attention after her involvement in the investigation on the death of another young Hasidic woman in ‘Invisible City’, and Rebekah relishes the challenge and dives into it headlong. Immediately coming up against, among other things, a hostile local community, a criminally uncooperative police force and an Aryan supremacist cell led by a dangerous drug and gun smuggler, Conrad Hall. Tough opposition, but what will be even harder for Rebekah will be to deal with the involvement in the events of her mother Aviva, through her much younger brother Sam. Like Aviva, Sam had run away from the family: his ‘sin’ was to be gay, made worse by his having been sexually abused by a member of the local Jewish community as a young boy. Something which Sam’s and Aviva’s family was aware of but refused to address, again to protect the family’s ‘reputation’. And for which Aviva carries a huge burden of guilt, convinced that her running away robbed Sam of the chance of having someone looking out for him. Sam grew up into a troubled young man, with a prison stint under his belt, and is in a relationship with Ryan, the son of, of all people, Conrad Hall. A secret relationship, because Conrad would probably murder Ryan, or Sam, if he found out. Dahl bounces the reader off the twin strands of Aviva’s and Rebekah’s narrative with ease, never letting the pace flag and drawing the reader in through the sheer intensity of two stories which will gradually converge to reach a shattering climax. Despite the toughness of the issues Dahl grapples with in, I truly admire how her outlook, through Rebekah and Aviva both, is always measured. Dahl avoids the trap of blindly lashing out at injustice, and there is plenty of it both from the Jewish and Gentile camps, further poisoned by the Aryan supremacists’ virulent hatred for Jews and gays. Dahl always goes for a balanced view, for clarity, working perceptive insights into how her characters see the world and deal with their lives. While some characters are unashamedly, irredeemably ‘bad’, most of the others are deftly portrayed in all their nuances, strengths and weakness. Reuniting with Aviva is a huge deal for Rebekah, and Dahl does very well to sustain the tension in this aspect of the story too, as the worlds of Rebekah, Sam, Aviva, the Hall family and the Hasidic Jewish community of Roseville are set to collide dramatically. Finally, well done Dahl for not ending the novel with the immediate aftermath of that dramatic collision, but for taking the time to follow through with Rebekah and Aviva with great perceptiveness and clarity. It didn’t feel like an anti-climax, but a well-placed final tile in the fascinating, gripping and hugely readable mosaic that is ‘Run You Down’. « A Treat for the Festive Season: Win Martin Holmén’s Stockholm Trilogy!